Home » DESTINATIONS » Stiff Amtrak Baggage Fees? Fuhgeddaboudit! Stiff Amtrak Baggage Fees? Fuhgeddaboudit! 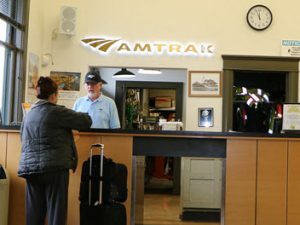 “Amtrak copies airlines, adds baggage fees,” or less accurately, “adds luggage fees.” You may have seen such scare headlines in your newspaper, magazine, or on TV, often suggesting Amtrak is interested in duplicating the airlines’ huge fee income. However, for most travelers, this is a non-story. Amtrak’s ongoing free baggage allowance would stagger almost anybody weaker than the Incredible Hulk. Each traveler can take on board up to two suitcases, weighing up to 50 pounds each, plus two “personal” items such as backpacks, laptops, or briefcases weighing up to 25 pounds each. That’s a total of 150 pounds. Have you ever tried to get on a train lugging 150 pounds of stuff? Didn’t think so. Yes, the fee beyond that major load is $20. However, obviously Amtrak doesn’t plan to get rich on that fee. Instead, it’s likely just trying to leave enough baggage space for everyone. All in all, this is one fee that you can, as the headline suggests, fuhgeddaboudit.